Eye On Sports Media: What Would A NASA Anton Apolo VII Mission Patch Look Like? What Would A NASA Anton Apolo VII Mission Patch Look Like? 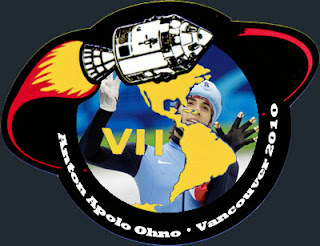 When Anton Apolo Ohno won his seventh Olympic medal, NBC Sports and others in the media started citing the phrase "Apolo VII," a historical reference to NASA's Apollo space program from the 1960s and 1970s. While I would not put Ohno's accomplishments in comparison to the heroism and bravery of the Apollo astronauts, I wondered what a NASA inspired Anton Apolo VII mission patch might look like. This is what I cam up with. Congratulations to Ohno and all the athletes participating in the 2010 Winter Olympic Games!